A doorway to “other dimensions” has been opened by the CERN Large Hadron Collider, according to someone with too much time on their hands and an active imagination. For the rest of us, it’s one of the most epic cloud formations you’ll see in your life. Just in time for this month’s premiere of the new Ghostbusters film, the real-life sky show could be a gateway for spirits and/or aliens to start to pouring through. 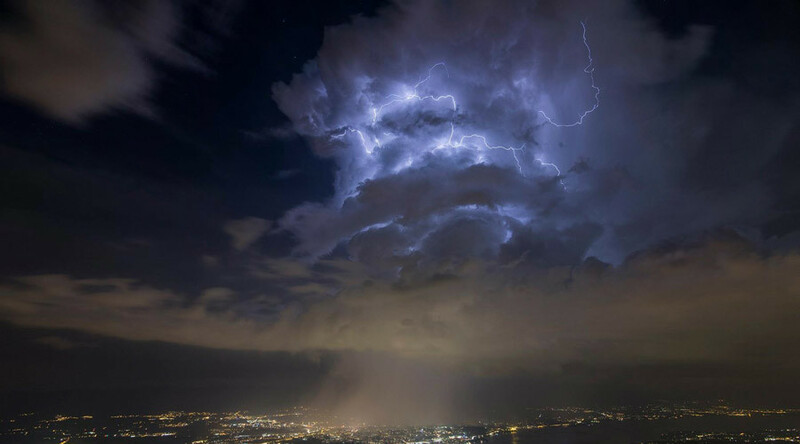 The eerie clouds and lightning above the facility that discovered the “God particle” were captured on June 24 by Joëlle Rodrigue on the Swiss side of CERN. “This is crazy. Just shut the thing down,” a representative from Freedom Fighter Times said in a video online, warning we should be “conCERNed” about the site where atomic-level research into the meaning of life is being conducted. The pending apocalypse supposedly can be backed by another image taken at the site showing a double rainbow, which they say signify “not gay pride, but a promise from God not to flood this planet because he is waiting for his people to repent and return from their sins,” a message the world should take seriously, according to the fake scientist. Then again, it could all be a promotion for Ghostbusters 3D, which is released in Europe next week and the US on July 15. The film can use all the help it can get after sexist trolls criticized the new female cast based on a single trailer. Next week, RT will bring you part two of our exclusive interview with the film’s producer Ivan Reitman, who directed the first two Ghostbusters.